It was a gathering of the crème of society recently in Lagos when a former Head of Corporate Affairs at the Nigeria Stock Exchange, gave out her daughter, Simi, in marriage to Abiodun Ajibodu. The traditional wedding, which held at the Harbour Point, had all the trappings of class. In attendance were guests including Mrs. Bola Shagaya, Chief Segun Osoba, Bolu Akin-Olugbade (who came in one of his Rolls Royce), Folorunsho Alakija, Erelu Abiola Dosunmu, and Moji Dokpesi (she came with her siblings). Performing at the event were artistes such as Wande Coal, Wizkid, 9ce and a host of others. …and Nike Osinowo shuns ex! 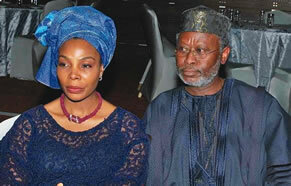 Though many of the guests knew the marriage had packed up and this couple (Nike and Dr. Duro Soleye) are separated, they were shocked to notice that the two behaved like strangers at the Idowu’s daughter’s wedding. Nike, not only ignored her former husband, she didn’t go any inch were he sat with some of his friends.